I had this on my work computer as wallpaper for a week. My computer monitor is pretty big and from day one, I started getting complaints about it. One person saw eyeballs, another got a quesy stomach. 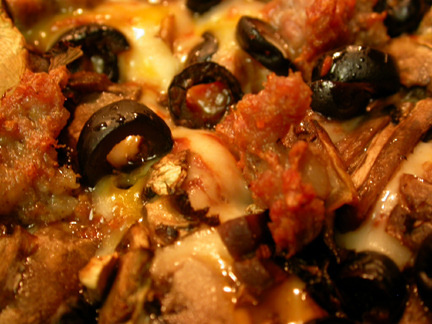 But it took most people a while to realize that it was the close up of a pizza with sausage, mushrooms and olives. Once they knew what it was, I started to get complaints about the toppings. I, On the other hand, started to see a little head form from one of sausages. Regarding my previous post, the Pretty in Pink sequel was an April Fool’s joke. May I suggest to John Hughes another sequel titled 32 Candles?? Minus Long Duk Dong unless his character broke out of the stereotypical Asian nerd role.